One of my musical mentors, Wesla Whitfield, would always end her jazz cabaret shows with what she called a “rousing closer,” meaning, a song that had the energy and intensity to rouse the audience’s delight… so they were sure to rise to their feet in a standing ovation. She knew how important it is to close a show with something stirring, exciting, and heartfelt. Something that will leave the audience dazzled, enchanted and begging for more. And she did it well. Every time. 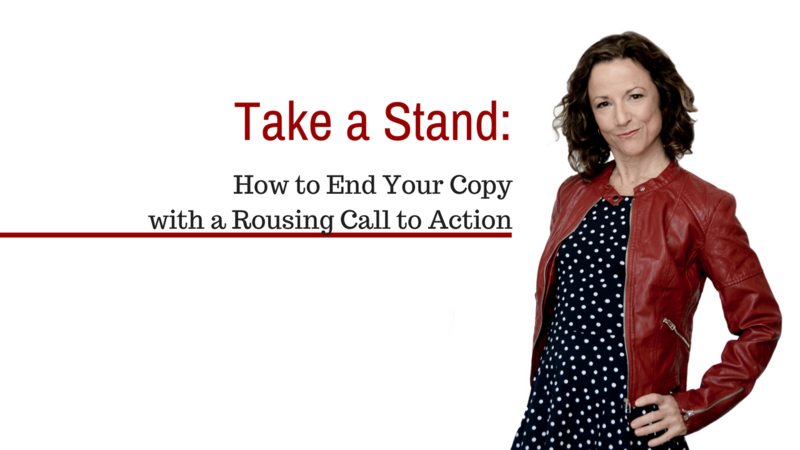 When you’re writing to your clients and would-be clients – whether you’re writing an email, sales page, blog post, or whatever – you, too, want to have a rousing closer. 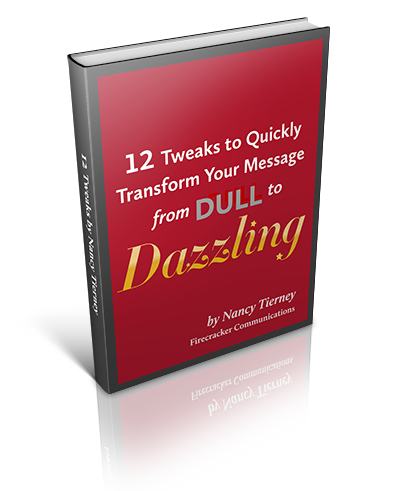 A way to end your copy that leaves your peeps encouraged, excited, (maybe even confronted), and inspired to take action. Now, this can be challenging. Especially at the end of your copy. Because you can feel as if you’ve already said everything. What’s left to say besides repeating your call to action? Jump on this now! Grab your seat. Read more here! So, today, I’m going to share one of my favorite (and, I believe, most effective) ways to close out piece of copy. Especially if it’s a piece of copy with a strong message that has meaning for me. I call it the “Take a Stand” closer. This is a closer that ignites your client’s passion, motivation, and confidence in their ability to make a positive shift in some way. It verbally takes a stand for their best interests, calls them on their excuses, and affirms they can have what they want. If they act. Listen, you can keep talking until your blue in the face about how you’re going to write your book, or… you can friggin’ write it! You can keep courting your excuses, or you can hook up with the creative energy that makes it easy for you to write with joy. It’s up to you. And whatever you choose is fine! But choose. Can you see how this closer pulls no punches and hits them with the white hot truth? It serves up a healthy dose of tough love, combined with an in-your-face choice that makes the reader take ownership of whatever choice they make. You may feel this type of close is too hard-hitting and you prefer a gentler kind of encouragement. That’s cool. But know this. Sometimes, you need to take a stand for your clients’ best interests by not letting them off easy. By calling them on their B.S. and refusing to allow them to go back to sleep in their hammock of habitual stuckness. This is our time as women to claim our worth and put an end to feeling limited in our ability to make choices. This means believing in ourselves and recognizing our divine power to create wealth, receive wealth, and empower our clients to do the same. Join me in ________ and let’s light the way for ourselves and our clients. Did you catch the evangelical tone in this? It almost reads like the end of a motivational speech or sermon. Unlike the first example, it’s more inspirational than confrontational. It speaks to what’s possible and what we must do to attain it. How can you use your words to get your client fired up about the possibilities? So they shake off their own limits, make a move, and change their situation? No more crying in your coffee about how hard it is to attract new clients. No more painful conversations with your spouse over your less than adequate income. No more feeling like a fraud, a phony, or a wannabe. This is your time to step it up and shine! These statements read like an impassioned declaration of freedom. Each “no more” statement releases the reader into a reality free of the fear, pain and shame they’ve been feeling around their business. You can do the same thing in your closer. Use a series of “no more” statements your client will resonate with, statements they’ll want to shout out loud in declaration of their new reality. As you write your own Take a Stand closer, think about your client or reader. How can you verbally take a stand for them, call them on their familiar excuses, and demand they take action on their own behalf? What do you need to say to rouse them from their sleepy, everyday trance of apathy, fire-up their inspiration, and get them to make a commitment to themselves? How can you cut through their own objections, boost their confidence, and get them to believe in what’s possible? Now, write a 2-3 line paragraph (or a series of strong statements) that will rouse your peeps to their feet with excitement, motivation and conviction! There are many, many ways to close out your copy. The Take a Stand closer is but one. But it’s a powerful one. Give it a whirl the next time you’re writing an email or page where you want to ignite your client’s passion and belief in themselves, and rally them into action. In fact, why not write one now, leave it in the comments below, and we’ll work on it together? Come on! It will be a blast. #1> P.S. Listen. You can keep stewing over your hormonal acne and despairing that you can’t find a real cure. You can keep checking the mirror, freaked out about the latest angry red wave of eruption. Or you can take one small step that will literally change your face and your life. It’s up to you. Whatever you choose is fine. But choose. #2 > And remember, this is your time to take back control and put an end to feeling anxious and embarrassed about your skin. You have the power right now to change everything in your life for the better, by taking this one simple step forward to claim a clear, beautiful complexion. Ready for the goodness to come? Ha, ha! I’m so glad the timing was good for you! I like #1 and #2. #3 feels slightly too salesy? #1 is strong, fierce… I like how you made it clear that all it takes is one small step. I’m voting for #1. You could change the end of it to: It’s up to you. So, why not make choice that will give you the clear, beautiful complexion you want? I think #2 could be a winner, too. So, let’s play with it! P.S. You don’t have to be anxious or embarrassed by your skin. You have the power right now to change everything in your life for the better, by taking this one simple step towards a clear, beautiful complexion. It truly is possible. Let us show you how. I don’t know this audience, but I’m guessing they’ve already tried a lot of things to get clear skin. The P.S. can reassure them that this isn’t another dead end, and give them an extra nudge towards taking action. Let me know what you think! And thank you for playing!